Spring has sprung...Our next meeting is Monday! 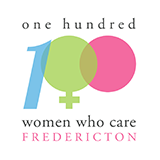 Bring a friend, bring your sister or mother to this spring's meeting of 100WomenWhoCare-Fredericton. 100WomenX$100=$10,000 for a local charity!